This tiny spider will blow your mind. Darwin's bark spider, Caerostris darwin, is less than an inch long. Nonetheless, this tiny native of Madagascar is capable of building the largest, strongest spider web on the planet. Ten times tougher than kevlar and twice as strong as any known spider's, the darwin's bark spider's web can cover more than 30 square feet and have anchor lines more than eighty feet long. These webs span lakes and rivers. Seriously. 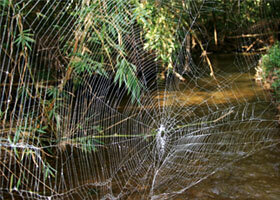 It is normal to see webs with more than thirty insects tangled up in their strands. Perhaps the most amazing thing about this spider, at least to me, is the fact that it wasn't documented by science until last year. This isn't some microscopic dung beetle, hidden away in the foul smelling dark waiting for some clothespin clad scientist to dig him up. This is a spider that weaves webs big enough to snag boats. That is just so great. It never ceases to amaze me how many countless wonders are out there in the world. Go, explore, seek out new things. I guarantee you will never run out of new discoveries. From the damp ground of the Ecuadorian cloud forests to the hot furnace of deep sea volcanoes, this world is truly a wonderful place. Funny that noone has discovered this kind of spider before. Of course the natives knew about it, but apparently didn't think to tell any scientists till very recently. Its interesting that few people recognize the wonders in their own backyard.